Have you ever faced a situation wherein you needed to click on multiple buttons at the same time? Maybe you wanted to click on a button exactly at a specific time and don’t want to miss it (for example, booking an appointment during rush hour). In these situations, we often need a tool that could automate mouse click actions without human intervention. 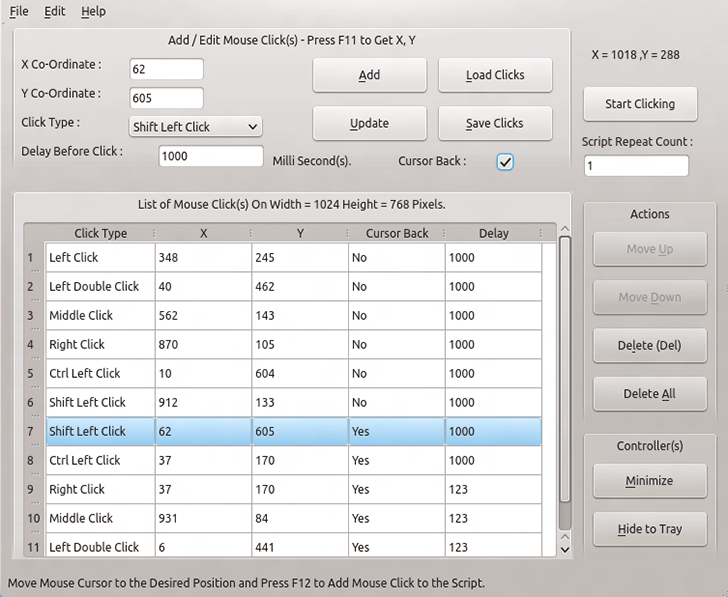 Auto Mouse Click is a mouse click automation software for PCs and Macs which allows you to pre-configure the position, timing and type of mouse clicks and perform them in sequence. It is a handy utility for skipping the tedious effort of sitting in front of the computer screen and clicking the same buttons repeatedly, or if even if you want to click multiple buttons in quick succession. Auto Mouse Click is available for Windows, Mac and Linux systems. Description and how-to guides for using the tools have been provided in the respective links. If you want to use mouse automation on dual monitors or on a single high resolution screen, you may also try another software called Auto Mouse Clicker, which is similar to Auto Mouse Click, built for bigger screens. All the automation utilities mentioned above are available on free-to-try basis. It’s often difficult to get passport appointments from the Passport website during rush hours; especially if you are trying to get multiple appointments (for you and your family members) on the same day. Limited number of appointment slots open up for a limited amount of time, and a lot of candidates compete for these slots. Even if you do manage to get an appointment for yourself, getting a second appointment on the same day is infeasible. With Auto Mouse Click, submitting multiple passport applications becomes really easy. Download and install Auto Mouse Click for Windows, Mac or Linux. Create the respective user accounts for your family members on the Passport website. Log in to each of the accounts in separate browser windows. Fill up the application forms for the different candidate in each of the browser windows, logged in with different user credentials. This is because, only one session may be allowed per user as a security measure. Complete all the steps for all the members prior to the final Submit button. Now, arrange the browser windows on the screen in such a way that neither of them overlap. Scroll to the position where the Submit button is visible in each of the browser windows. Launch the Auto Mouse Click utility and Pick the mouse click positions of all the Submit buttons on screen. Setup Auto Click to double-click on the Submit buttons, and schedule it to run at an appropriate time. Now sit back and relax as all your appointments are booked successfully. Note: The steps may slightly differ based on the particular situation, but the application of the utility should be fairly similar. The above use case is just an example of the application of Auto Mouse Click. The potential of what this tool can help you achieve, is only bounded by your own imagination. Let us know about your opinion on this handy utility in the comments below. Disclaimer: This article is meant for educational purposes alone, and is not intended to promote any kind of illegal activities. 7labs may not be held responsible for the misuse of any information provided in this article.